We all know the story. We learn as children how the dinosaurs roamed the planet until an asteroid hit the Earth, which eventually led to the global extinction of some of the most fascinating creatures that have ever lived. So... what if it never happened? 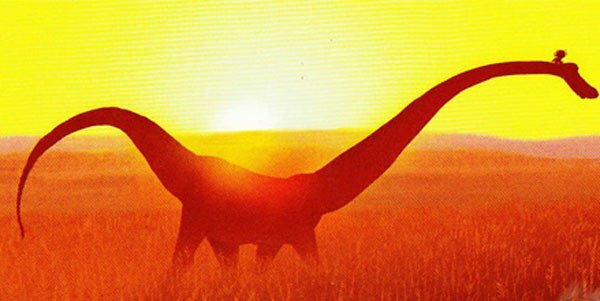 That’s the question that Pixar will be asking with their next animated feature, The Good Dinosaur. "I think our next movie asks the biggest what if of all. What if the asteroid that wiped out dinosaurs actually missed earth?. According to The Hollywood Reporter, this fall’s Good Dinosaur tells the story of a lost dinosaur, named Arlo, and an orphaned boy, who Arlo calls "Spot," who meet each other and travel together on an adventure. Lasseter called it "a boy and a dog story, but the roles are reversed." Like with many Pixar films, while humans are present, they are not the focus of the film. It will be interesting to see what the interaction between humans and dinosaurs looks like. It certainly sounds like dinosaurs are still the "dominant" life form on Earth. Will the humans in the film play the role of sidekick, or pet? Lasseter is promising a "unique tone, unlike any animated film made" which is quite a statement. While most of the attention being given to Pixar’s upcoming projects is focused on 2016’s Finding Nemo sequel, Finding Dory, comparatively little is known about The Good Dinosaur. The film has gone through some significant changes over the last several years, causing it to be pushed back from it’s original release date of last summer. The film will be directed by Peter Sohn, who has worked on several Pixar films as both an animator and voice actor, but this will be his first time at the helm. Originally Sohn was set to co-direct with Bob Peterson, one of the directors behind Up, but now he’s working solo. The voice cast includes Neil Patrick Harris, John Lithgow, and Francis Macdormond. The Good Dinosaur is scheduled to be released on November 25, 2015 and will be accompanied by the animated short, Sanjay's Super Team.